The Triple is designed for jumping over mounds of dirt, but also makes for a fun play bike on the trails (click to enlarge). 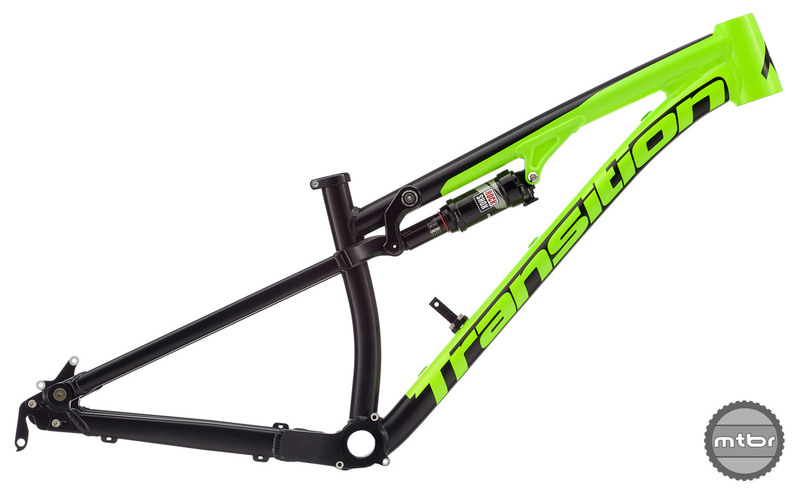 While Transition has recently released a series of popular trail bikes, their original success was based on hard charging freeride-oriented models. In the intervening years, they’ve dropped favorites like the Blindside, BottleRocket and Double from the line up, but turns out they haven’t forgotten their roots. The concentric BB pivot results in zero chain growth, which allows for easy single speed setup (click to enlarge). Their latest play bike, the Triple, is a modern take on a short travel slopestyle rig. It uses a concentric bottom bracket pivot so it can be setup single speed without a tensioner and has a progressive leverage rate curve. While the Double weighed almost 8 pounds with shock, the Triple is a comparatively svelte 6.2 pounds (click to enlarge). Out back, it uses a dirt jumper approved 10x135mm adjustable dropout system. When slammed, the chainstays are a very short 390mm. There are also provisions for a downtube shifter. 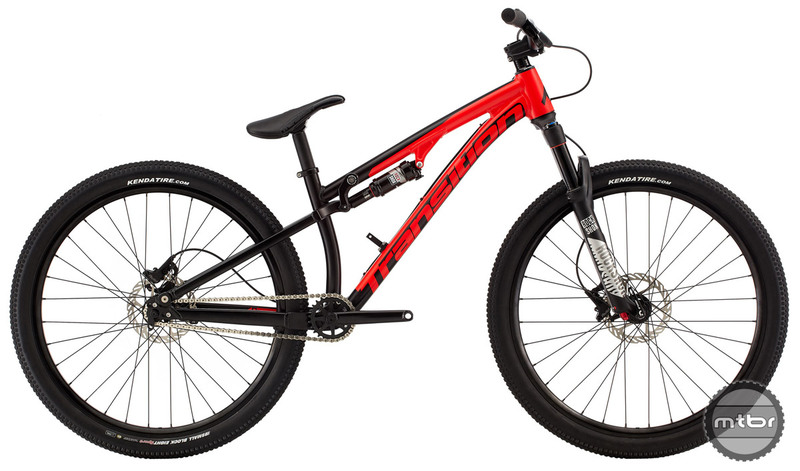 With a short wheelbase, compact stays, and a steep headtube angle, the Triple is ideal for playing around at the dirt jumps or racing slalom (click to enlarge). The frame is only available in a “one size fits all” size. Complete bikes are $2,599. Frame only is $1,499. The Triple is designed for jumping over mounds of dirt, but also makes for a fun play bike on the trails. The concentric BB pivot results in zero chain growth, which allows for easy single speed setup. While the Double weighed almost 8 lbs with shock, the new Triple is a svelte 6.2 lbs. 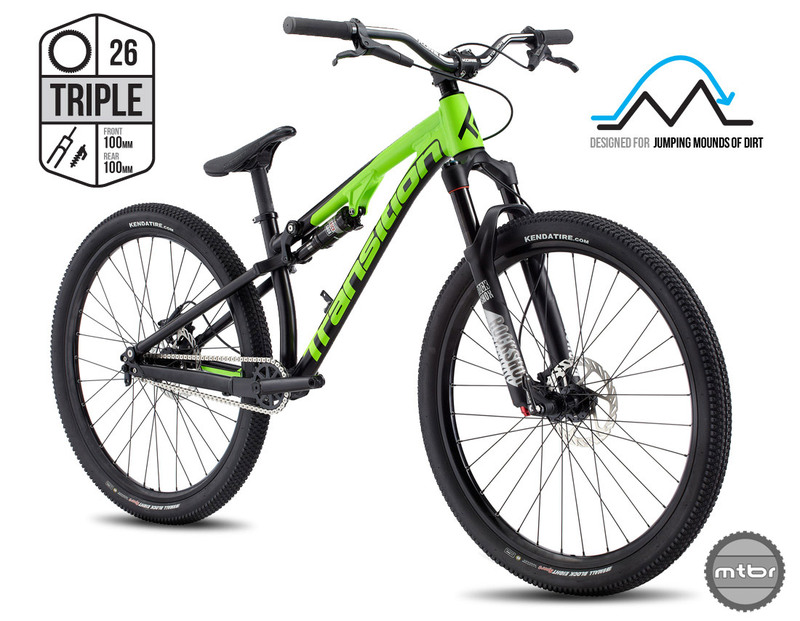 With a short wheelbase, compact stays, and a steep headtube angle, the Triple is perfect for for playing around at the dirt jumps or racing slalom.